Election Day 2014 is now almost exactly seven months away, which is both near and far. On the one hand, more than half of the states — 29 of 50 — have passed their filing deadlines for major party candidates (the deadline in a 30th, Tennessee, is today). The late entries of Rep. Cory Gardner (R, CO-4) and ex-Sen. Scott Brown (R-MA) into, respectively, the Colorado and New Hampshire Senate races are probably the last major candidate announcements we’re going to see this cycle, barring a late retirement or other big surprise. So the playing field is basically set. On the other hand, the specific players in the game are not set. Just two states — Illinois and Texas — have held their primaries. After the District of Columbia voted on Tuesday, there isn’t another primary until May 6. Candidate selection, particularly for Republicans in places like Georgia, Iowa and North Carolina, could be a decisive factor in the battle for the Senate. 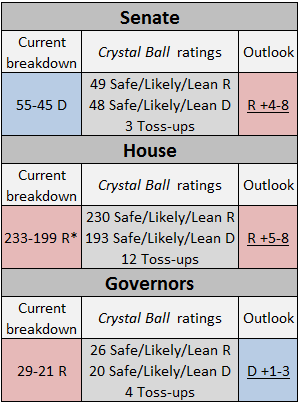 So with the caveat that plenty can change, we know enough about the political environment, fundamentals, candidates and other factors that will impact 2014 to offer a new Crystal Ball feature this week: Narrow ranges of what we expect will be the net partisan changes in the makeup of the Senate, House and roster of governors. We will continually tweak this Crystal Ball Outlook, and readers can find these ranges, along with our ratings, on our House, Senate and governors pages on the Crystal Ball website. As is our custom, we will call every race before Election Day, even the pure toss-ups — recognizing that universal prediction guarantees some mistakes. We also hope to further narrow these ranges in the coming months, but there will be some uncertainty in many contests until the bitter end. Notes: *3 vacancies in House: Two are Safe Democratic, one is Safe Republican; 14 governors and 64 senators are not up for election this fall, but for the purposes of this chart the races not contested this cycle are considered Safe for the incumbent party. Structural factors argue for at least minimal Republican gains in the House. The president’s party almost always loses House seats in a midterm election, and President Obama’s middling approval only makes a loss of seats more likely. Regular readers will probably wonder why we repeat this so often, but it’s a central point that must be stressed in any midterm discussion, and it’s more important from an overall standpoint than the latest gaffe or fundraising report. By historical standards, a single-digit gain for the out-of-White House party in the House during a midterm would actually be something of a poor performance: In just six of the 25 midterms conducted over the last century did the president’s party lose fewer than 10 seats (it gained seats in three). That said, the GOP is already at a fairly high ebb in the House: At 234 seats — assuming, as we do, a Republican wins the special election to replace the departed Rep. Trey Radel (R, FL-19) — they are just 13 seats short of winning their biggest House majority since 1928 (the previous high-water mark for them was 246 after the 1946 midterm). If the election were held today, Republicans would probably not reach that lofty goal, but would likely add somewhere between five and eight seats. In addition to two heavily Republican seats that Democrats are vacating (NC-7 and UT-4), the GOP also has a handful of highly credible targets in places like Arizona, California, Florida, Illinois, New Hampshire and West Virginia. While Democrats retain a small, roughly tiny lead in averages of national polling on whether voters would prefer a Democrat or a Republican to win their local House race, these generic ballot polls generally have a built-in Democratic bias of at least a few points. Democrats have some tempting targets as well, including some open, competitive seats, but their ability to truly capitalize and thus net seats is contingent on a considerably better national environment than currently exists for them. Put it all together, and a modest GOP gain in the House is the current likeliest outcome. The same structural factors that benefit Republicans in the House also benefit them in the Senate: The president is a Democrat, and he’s not that popular. There’s an added GOP bonus for the upper chamber: arguably the best map in at least a generation. Almost all Republican seats are reasonably safe, mainly because they are in solidly Red states, and there are some shaky Democratic incumbents and open seats on the ballot in distinctly Red states. A few weeks ago, we wrote that the 10 Senate seats likeliest to change parties were controlled by Democrats. That analysis pre-dated, by mere hours, the entry of Scott Brown into the New Hampshire Senate race against Sen. Jeanne Shaheen (D-NH). So now, the 11 Senate seats likeliest to flip are controlled by Democrats. Our ratings show four Democratic-held Senate seats at least leaning to the Republicans (Arkansas, Montana, South Dakota and West Virginia). Are these races guaranteed for the Republicans? No, though two, South Dakota and West Virginia, are looking very good for them. But it seems conservatively reasonable that the GOP will win at least three of the four aforementioned Democratic seats we currently at least lean their way, and then at least one of the three toss-ups, all of which have Democratic incumbents (Alaska, Louisiana and North Carolina). That forms the low end of our range, four, which also assumes that the Republicans don’t kick away one or more of the seats they already hold, such as Georgia. The high end would involve the GOP winning all seven of the aforementioned seats along with one other Democratic-held seat. At this point, the likeliest one might be Iowa, which we still call Leans Democratic — ever so tentatively with recent developments. The Hawkeye seat is now winnable for the GOP, but Republicans need to nominate the right candidate, which would probably be either state Sen. Joni Ernst (whose ad you might’ve seen recently) or businessman Mark Jacobs. The likely Democratic nominee, Rep. Bruce Braley, got himself in trouble last week for some comments to trial lawyers that denigrated Sen. Chuck Grassley (R-IA) and farmers, more broadly. Will the gaffe matter? Probably not in isolation, though this was a serious and wholly self-inflicted blunder. But it could be a sign that Braley might actually not be the great candidate many expected him to be, which would damage Democratic hopes in a state where President Obama is already consistently below 40% in approval — a danger sign for Braley all by itself. Colorado, Michigan and New Hampshire are other credible Republican targets, but even though the Granite State race is likeliest to get the most attention, we see it as the heaviest lift of any of the states we’ve mentioned. Shaheen remains popular, and even if Brown runs a consistently strong campaign — he hasn’t thus far after dithering for months on whether to enter — we still wonder if voters in Brown’s new state really will want a senator from Massachusetts. Long-time New Hampshire residents often seem resentful about the come-heres from the Bay State. Given the midterm dynamics and playing field, we can more easily imagine upgrading, rather than downgrading, Republican hopes. We still see control of the Senate as something of a coin flip, with perhaps a small Republican edge at the moment. For those on the right counting unhatched chickens, we gently remind you that early spring’s visions sometimes do not materialize as expected in late fall. It might seem odd to expect the Democrats to net gubernatorial seats in what we’re otherwise describing as at least a modestly Republican year, but the governors’ races operate under slightly different rules and are not quite as nationalized as the federal races (while still being fairly nationalized and partisan in recent years). One structural factor that explains our gubernatorial prospectus is that there are currently more Republicans who are governing states that President Obama won in 2012 (10) than Democrats governing Romney states (five). Of the five Romney-state Democrats, only one — the open seat in Arkansas — is up for election this cycle, and it’s also the Republicans’ best opportunity for a gubernatorial pickup (Democratic Illinois is second). Meanwhile, of the 10 Obama-state Republican governors, nine are up for reelection, and three stand out as quite vulnerable: Govs. Tom Corbett (R-PA), Paul LePage (R-ME) and Rick Scott (R-FL). Corbett and LePage are particularly endangered, and part of that is simply that their states are more Democratic than the nation as a whole, while Florida is a touch more Republican. Just as the Democrats are overexposed in Senate races by having to defend Romney-state incumbents, some Republican governors are exposed in Obama states. The difference is that the national environment and likely voter base are both probably going to be at least somewhat in the Republicans’ favor in November, which could carry a few weak incumbents over the finish line. Still, it would be surprising if the GOP ended 2014 with more governors than they had when the year started. (The GOP currently holds 29 of 50.) So right now we suspect a modest net Democratic gain of one to three governors’ mansions. There’s an old saying about politics and policy: “Where you stand depends on where you sit.” That is, your positions are influenced by factors such as the location of your district or state, and whether you are in the executive or legislative branch (and which house of the legislature). To describe the 2014 election, let’s turn that aphorism around: “Where you sit depends on where you stand.” Prior gerrymandering and Republican election victories have produced a GOP-tilting House that operates in a close range of seat gains and losses. Republicans aren’t going to secure a massive House majority (such as the Democrats had in parts of the 1960s and 1970s) but the GOP would also have to work even harder than they did during the government shutdown last year to throw away control of the House. For the Senate, the combination of 2014’s good environment and concentration of contests in conservative territory leaves them sitting pretty. The only remaining question appears to be whether they can gain the full six or more seats needed to capture control. In a sense, Democrats are paying a delayed price for their 2008 sweep of key races in the upper chamber. The statehouses may provide the only ray of sunshine for Democrats in November because Republicans are somewhat overextended in Blue and Purple territory. In a situation analogous to the Senate, but with the parties reversed, the GOP did so well in the last big set of governorship contests in 2010 that some retrenchment is due. Now we can see why they say that politics, like life, is a zero-sum game.